– a week of self-indulgence and personal development with the prospect of joy, fun, immersion and springboarding to liberating new insights – guided by 30 years of experience in the field of fasting. You fast for five days on organic vegetable broth, organic herbal teas and freshly-pressed vegetable juices. You gain daily health-building knowledge about your body, nutrition and psychology. You learn about stress management, unconquerable robustness, well-being and self-leadership from the world champions: the body and nature. You expand your brain capacity, improve your health and increase your quality of life. You invest in yourself, your well-being, your self-worth, your integrity and your growth. You slow down totally and completely unwind. You are revitalized and your energy levels are renewed. You are pampered daily with relaxation, yoga, meditation, massage and a footbath. You discover the essence of who you are through tranquility, self-insight, joy, fun and laughter. You gain such physical and psychological reserves, self-insight and energy, that – in a most un-Danish way – it defies both “the law of Jante” (who-do-you-think-you-are? attitude) and at times perhaps even the law of gravity. Matti Straub-Fischer, Headmaster, Kaospilots, Switzerland and Chief changel and coach, Changels, Switzerland. “The fasting seminar with Helen was a profound and joyful experience which exceeded my expectations. Her 30 years of personal experience with fasting together with a background in psychology, nutrition and physical therapy inspired trust and relaxation through the week. Whilst abstaining from food for five days may sound rather bleak, it was, for me, a surprisingly pleasant experience with barely any discomfort or drama, quite the opposite, in fact. 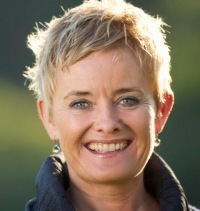 Helen Eriksen is one of Europe’s most experienced fasting seminarleaders with 30 years of experience in the field of integral leadership and organisational development, holistic health education, and an expert in stress prevention and well-being. Seminar place: a lovely estate, surrounded by old trees in the park and a moat, with a peaceful and soothing athmosphere and space for reflection. Fireplace included. 15 minutes from the seaside. Accomodation: nice two-bedded rooms, shared shower and toilet facilities. Price: for the seminar incl. lodging in two bedded rooms 950 euro, 25% VAT included. Helen Eriksen and the fasting team look forward to sharing this powerful and fruitful experience with you.